Ginger Balsamic Glaze: Made from white balsamic vinegar and ginger which is slowly reduced to a nicely balanced thickened cream. This velvety glaze is sweet and peppery with a beautiful golden colour.Delicious on raw or cooked vegetables, with cheese, white meat, carpaccio, dried beef, potatoes, fish, sushi, sorbets, biscuits and on desserts. 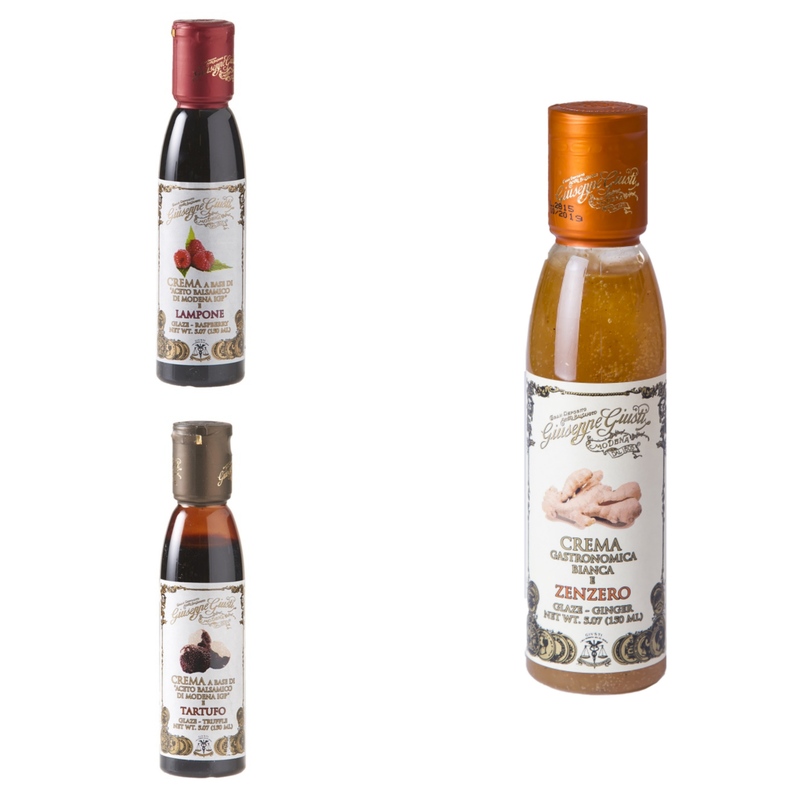 Raspberry Balsamic Glaze: This raspberry balsamic cream glaze has been made by the Giusti family in Modena by skilfully reducing aged balsamic vinager without the addition of any caramel or colouring. It has a thick consistency, a fine velvety texture and an exquisite raspberry flavour. Popular with chefs, balsamic glazes are really easy and versatile to use at home, giving a fabulous finishing touch to a range of dishes. Try it drizzled on ice cream, fruit salads, in yoghurts, with pork, chicken or salmon dishes or on a salad. Truffle Balsamic Glaze: This truffle balsamic cream glaze has been made by the Giusti family in Modena by skilfully reducing aged balsamic vinager without the addition of any caramel or colouring. It has a thick consistency, a fine velvety texture and an exquisite truffle flavour. Popular with chefs, balsamic glazes are really easy and versatile to use at home, giving a fabulous finishing touch to a range of dishes. This delicious glaze will give a boost to the flavour of your grilled meats, salad dressings (just add to our extra virgin olive oil), grilled, steamed or raw vegetables and cheese. 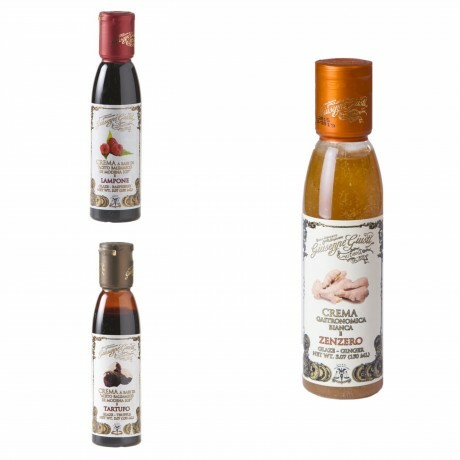 Modena balsamic vinegar (67%), white wine vinegar, cooked grape must, sugar, glucose syrup, modifier: corn starch, natural flavour, contains sulphites.